2. Prevent children from inserting fingers or other tiny objects into the slots. 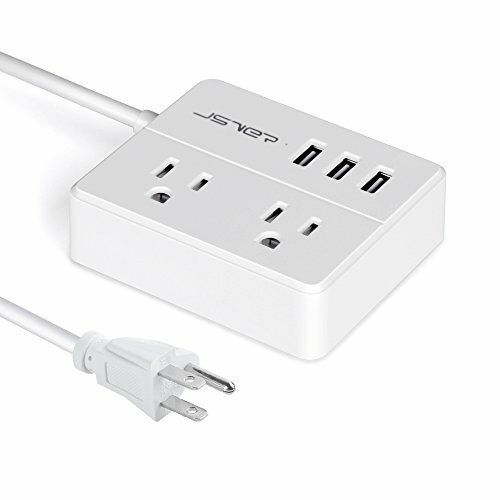 Turns a regular power outlet into a 3 port smart USB charger with 2 AC outlets, and eliminates the need for multiple chargers, saving money and desktop space. Fully embracing the smart charging technology, every single USB port can intelligently identify your device and seek to maximize its charging speed. Each port supports up to 2.4A - meaning there is no need to decide between different ports. Providing enough power outlets to handle all your devices at once, whether in hotel room, airport terminal, or coffee shop. With the JSVER mini power strip, you do not have to choose which to charge firstly. Designed to sell in North America, the parameters of this item are represented in compliance with American Standard, so the rated voltage of this unit (labeled on the item and written in User Manual) is 125V. But this power strip can also be used with an adapter if you travel to an area with rated voltage of 240V, such as some European countries. Please contact customer service if you have any questions about this issue. This product comes with a guaranteed 18-month warranty and friendly customer service.